The Bahamian flag consists of three horizontal stripes of equal width, with a horizontal black triangle originating from the left side of the flag and facing right. The top and bottom stripe of the Bahamian flag are aqua blue, and the middle stripe is yellow. 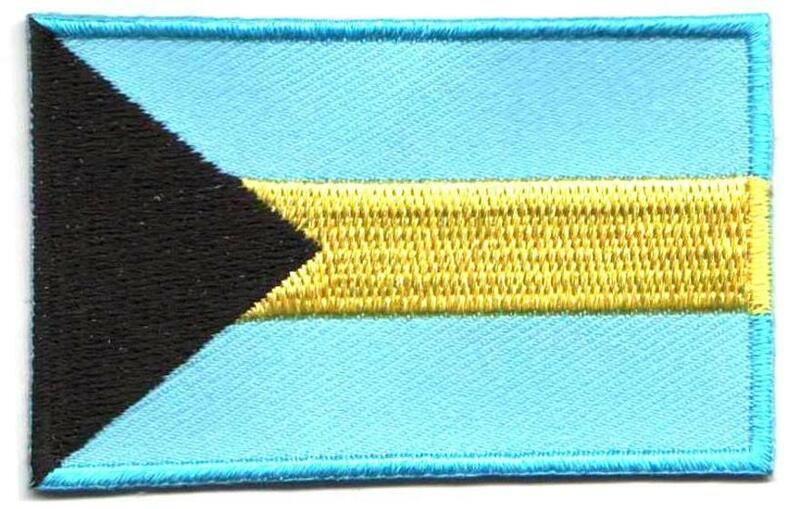 Meaning: The yellow stripe in the middle of the Bahamian flag represents the sandy beaches of the 700 Bahamian islands, and the aqua blue stripes symbolize the ocean waters that surround it. The black triangle stands for unity of the Bahamian nation and the people's determination to develop the land and the sea. History: The present day Bahamian flag was adopted on Jul. 10, 1973. Previous versions of the Bahamian flag were designed with the British Union Jack depicted, as the Bahamas was named a British colony in 1783. In 1973 The Bahamas received its independence from Britain but remained a member of the Commonwealth of Nations. Interesting Facts: The Bahamian flag's original design had two yellow stripes surrounding a blue stripe. However, this Bahamian flag was rejected and the color patterns were reversed (source: worldflags101).